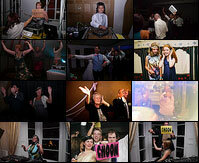 DJ Brighton | Wedding & Private Party DJ - Brighton | What is Stick It On? What is Stick It On? We are THE alternative DJ entertainment service. Stick It On is a very simple and completely unique concept that has been rocking parties for almost two decades. With a Stick It On party, you and some of your guests get the opportunity to get behind the decks and BE the DJ to play three of your favourite songs! Our professional DJ technical helper will host and support the DJs every step of the way, guaranteeing a musical journey spanning genres and decades creating a wonderfully eclectic mix, and a full dance floor. Our organisation is warrior-level and we guarantee that you will have the control over the final playlist so you get the music you ultimately want for your event. Stick It On creates some wonderful dance floor moments that will rock your party. It’s simply a chance for people that love music to share their favourite songs with their friends, family and colleagues. Stick It On was born in the year 2000. Originally a club night in Brighton, the idea came from a simple love of playing a wide range of great music and seeing the positive reactions a great song can bring. Founder Rob Drysdale is a music lover and rebelled against being pigeon-holed into playing just one genre. To him, there are only two types of music; good and bad. Rob was only interested in the good stuff! Rob played everything from pubs, small club nights and house parties, but what was clear to him was how much fun it is getting behind the decks and playing music to people.